, but life-size cardboard cut-outs made by Le Gun, the London-based collective of designers and illustrators featured in ‘Garage Band’ in the Summer 2007 issue of Eye (no. 64 vol. 16). Over the past year the Le Gun members have managed to continue their distinctly independent approach while balancing the pressures of economic survival and creative autonomy with a wry sense of humour. 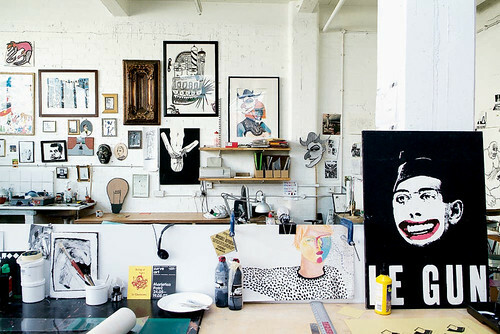 Below: Le Gun studio, East London. Photograph by Anthony Oliver. In addition to populating D&AD’s ceremony with hundreds of monochrome figures – an inspired commission from Matt Willey’s Studio8 (see ‘Wanted: self-images’, Eye no. 66) – Le Gun’s illustrators and designers have produced visuals for Madness’s vaudeville-inspired show The Liberty of Norton Folgate at the Hackney Empire and created a series of limited edition T-shirts for fashion label The Duffer of St George. Perhaps more significantly, the collective has signed a deal with Mark Batty Publisher, which (they hope), will secure the long-term future of their occasional publication, also called Le Gun, with its rolling, seamless (and ad-free) montage of images and texts. The deal will enable future editions of the magazine to be published in its distinctive large format (343 x 245mm). The first three editions, now out of print, are to be republished in a single volume. Their activities are documented regularly on their blog. Le Gun #4 is to be launched on 27 August with an exhibition and ‘temporary arts club’ entitled ‘LE GUN: The Family’. This promises ‘a rich and slippery harvest of pictures and words’, including work by Andrzej Klimowski, Will Sweeney, Paul Noble, Barry Miles, Sebastian Horsley, Richard Milward, Iain Sinclair and Michael Smith. Below: two- and three-dimensional party people (who?) at the D&AD Awards, summer 2008. Photograph: Carl Court. 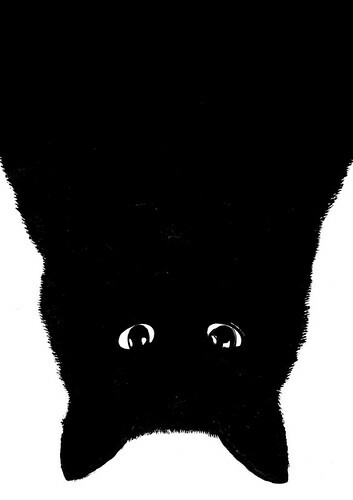 Below: upside down cat illustration for cover of Le Gun no. 4, out August 2008.